Fan-Fiction or Handbook to ‘Die For’? BOTH!!! Hi everyone. I’m keeping busy and getting very excited about some upcoming stuff I’ve been looking forward to. Since I was raised with Italian superstitions, I’ll talk about them after the fact. Hope all of you are well. Those of you who are kind enough to follow and read all my posts are most likely sick of me discussing ‘reviews’ at authors’ blogs. When online author-pal PJ Reece asked me to give his (then pre-) released book a look-see prior to it going live at Amazon, I had to say yes. Why? B/c I’d already read–and loved and internalized–this book’s predecessor, STORY STRUCTURE TO DIE FOR. I also enjoy PJ’s blog articles, so I had a very strong inkling I was going to get somethin’ real good out of PJ’s latest work. 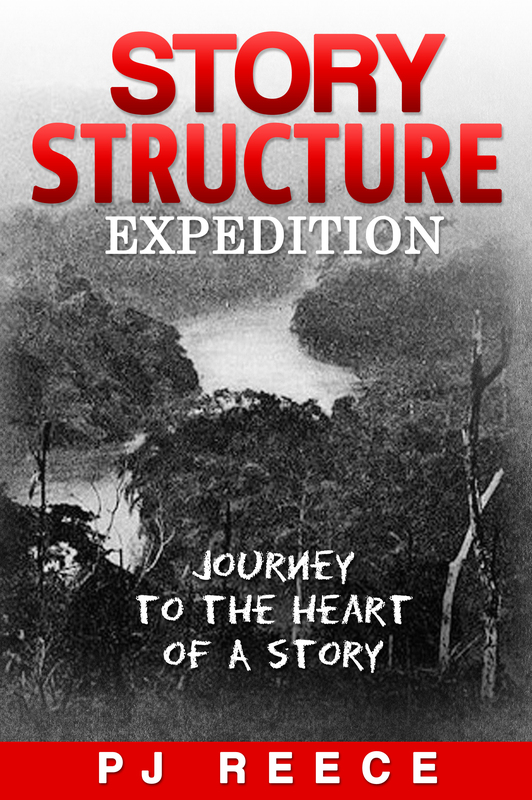 STORY STRUCTURE EXPEDITION: JOURNEY TO THE HEART OF THE STORY by author PJ Reece is (to me) a fan-fiction based on Joseph Conrad’s classic novel, HEART OF DARKNESS. The author sets himself up as protagonist while his writer takes him through his story journey (i.e., character arc) via a Congo River expedition, based on the events of Conrad’s novel. I found PJ’s hundred-page essay (as he referred to it) VERY entertaining. Had I paid attention in high school and read Heart of Darkness, I might have related even better to PJ’s work. Nonetheless, I thoroughly enjoyed his excellent command of language and writing skills; his wit and humor, as well as the story journey. PJ also challenged and put me in a position to expand my vocabulary: I looked up many words via the electronic dictionary built into Kindle’s app. This is what you’ll be reading: (from PJ’s protagonist’s “writer’s” ‘synopsis’): story fanatic commissions a tin-pot steamer to retrace Marlow’s journey up the Congo into terra incognita. Our protagonist imagines a series of instructive dispatches along the way, scenes that portray the river as a metaphor for every story’s journey to the story heart. Same story structure mechanics told a different way? Perhaps, but PJ puts a spin on it that I related to and seem to be digesting and/or internalizing readily. STORY STRUCTURE EXPEDITION: JOURNEY TO THE HEART OF THE STORY is a refreshing companion/follow-up to its predecessor, STORY STRUCTURE TO DIE FOR. I can’t imagine any writer won’t be a better writer after having read either (or both) of these works. You have me sold. I even looked them up and over the past 25 years I’ve purchased many, many hard cover books on writing. Let me know what you think once you’ve read PJ’s work(s), if you agree with my thoughts–or if you don’t (and why 😘)! Thnx! What an interesting spin to put on a writing book. Very adventurous, and it sounds like the material better sticks with the reader as a result. I will vouch that it does, in both overt and subtle ways. Kind of how the events that form the backdrop to historical fiction spark my interest to know more. Many times I delve in deeper, and it all sticks with me so much better than anything related class in high school ever did! Thnx! Joanna… Big THANX for that pitch! And glad I am that my “essay” found a reader. You know, as writers, we never know, do we? We don’t really know what we’ve done until someone reads it and responds as you have done. Your review is a key part of the writing process. Sometimes I look at that story structure expedition and I say, “Who wrote that?” And “What is that?” I like to call in “an entertainment for writers.” It was apparently written in the wee hours of many many mornings by someone obsessed with reaching the heart of the story. My wish for all writers is that we know how we can get there at will. So we can love our protagonist to death. I’m always looking for more keys to structure; one that’s sort of dramatized would be most helpful! eporter… Dramatized is right. It’s more like I got dramatized! Once I realized that I would have to play “protagonist,” it struck me that I would have to actually suffer. And I did. For a long while I had no idea how I was going to resolve the journey. Just had to keep going. Enjoy!